CHICKENS For the 2019 season, we have a mixed flock of nearly 200 organic hens, with their three rooster companions. Everyone is fed Certified Organic grain that is grown, mixed and milled just down the way in Rosebush, by Graham's Organics family farm. They also get lots of veggie scraps from the fields as well as free choice Organic kelp, grit and oyster shells. ​All of the chickens spend the fair months of the year outside, on pasture. The girls are rotated once a week around the fields to new, fresh ground, while enclosed in a mobile, electric fence which keeps them safe from ground predators. Moving them around once a week ensures they have fresh forage and bugs to pursue while distributing their manure and scratching tendencies. 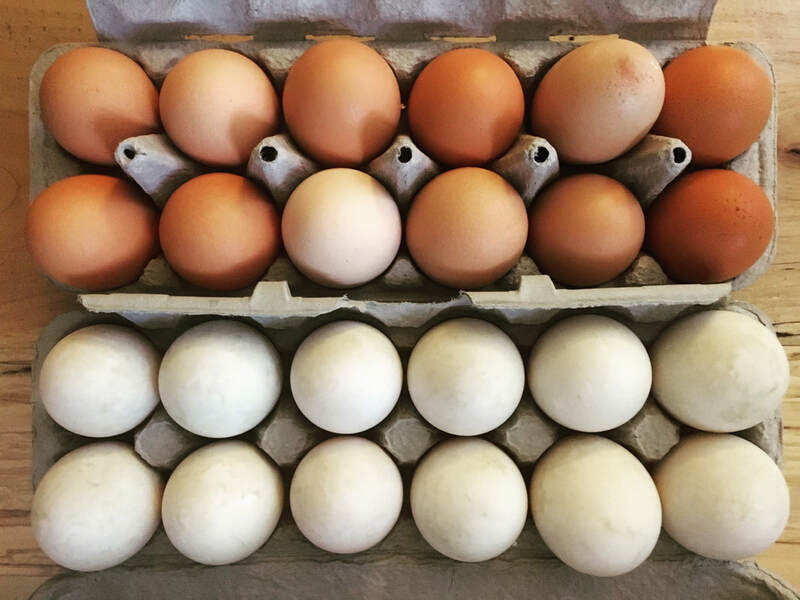 You can find our chicken eggs by visiting our stand at the Midland Farmer's Market or by purchasing directly from the farm, through our farm store. On our farm, our chickens lay brown, pink, green and blue eggs. It's the ducks and geese that produce the white, almost blue-white eggs! Unlike the chickens, the ducks and geese are much more efficient foragers. This means they need less grain to grow and produce eggs as the chickens because they're better able to utilize the plants and bugs they eat during the day. This results in a darker, richer yolk, high in carotenoids and protein! If you've never tried them, duck eggs are very similar in taste to chicken eggs except you might find them to be richer in flavor, due to their larger yolks! Ducklings born on the farm in the summer of 2018.